Detectives arrested six people and seized thousands of packets of heroin in a four-month long investigation, according to the Passaic County Prosecutor’s Office. 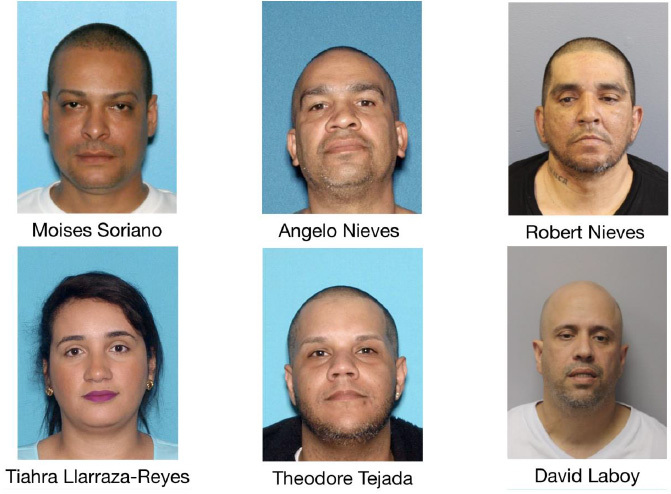 Moises Soriano, 45, of Passaic City; Angelo Nieves, 49, of Paterson; Robert Nieves, 54, of Paterson; Tiahra Ilarraza-Reyes, 32, of Passaic City; Theodore Tejada, 37, of Paterson; and David Laboy, 51, of Bogota, were charged with possession of heroin, intent to distribute, and conspiracy to distribute. Additionally, police charged Soriano with maintaining a drug production facility, possession with intent to distribute 500 feet of a park, intent to distribute drugs in a school zone. Both Nieves was charged with endangering the welfare of a child and intent to distribute in a school zone. Ilarraza-Reyes was charged with intent to distribute in a school zone, maintaining a drug production facility, and intent to distribute 500 feet of a park. Detectives raided locations in Bergen and Passaic counties, seizing one kilogram of uncut heroin, in excess of 3,000 glassine envelopes of heroin, drug packaging equipment, and $40,000 cash. Drug seized is valued at $100,000, authorities said on Monday afternoon. Ever think they might not be here illegally. Possible they were born here.